Sun City Anthem supports a vibrant lifestyle with multiple clubhouses filled with wonderful amenities. Sun City Anthem was opened in 1998, by Del Webb, and completed in 2008. Today, the community includes 7,144 homes in both attached and single-family designs. Although construction is complete, homebuyers can choose from available homes on a resale basis. For residents of Sun City Anthem, social and recreational activities begin at the Anthem Center. This 77,000 square-foot clubhouse features hobby and game rooms, arts and crafts studios, a computer center, multipurpose rooms and the Grand Ballroom. Residents can mingle in the social lounge or share a meal in the Anthem View Restaurant. There is also a state-of-the-art fitness center, complete with an aerobics and dance studio, indoor walking track and an indoor lap pool. At Independence Center, a 31,000 square-foot second clubhouse, residents will find additional amenities. These include a 300-seat theater, an arts and crafts studio, a woodworking shop, a well-stocked library and a billiards hall. Independence Center also has its own fitness center, multipurpose rooms and an outdoor courtyard which is ideal for community events. A third facility, Liberty Center, offers indoor and outdoor swimming pools, and sports courts for tennis, pickleball and bocce ball. Resident golfers will also love living within easy access of The Revere Golf Club, one of the Las Vegas area's premiere golf clubs. The Revere Golf Club offers spectacular scenic views from two 18-hole championship golf courses, as well as practice facilities, a full-service pro shop and on-site dining at Buckman's Grille. When it comes to homes, Sun City Anthem includes options from affordable villas to spacious single-family designs. Over the course of the community's ten year development period, Del Webb offered 31 different floor plans, ranging in size from 1,080 to 3,175 square feet. Most of the homes throughout the community include two or three bedrooms, two to three bathrooms and two- to three-car garages. The smallest model was available with just one bedroom and one-and-a-half bathrooms, while the largest designs could include up to four bedrooms and four bathrooms. Every home offered covered front porches and rear patios for outdoor living, and some of the larger homes were built with optional casitas and front courtyards. 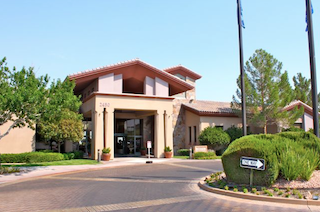 With spectacular scenic beauty, resort-style amenities and appealing homes, it's easy to see why Sun City Anthem continues to be a popular destination for active adult retirees.